If you want to avoid making mistakes, then stop relying solely on your gut to make decisions. Make decisions based upon facts, not your gut feelings. Maintaining an updated bookkeeping system is a good way to avoid gut feelings. You may feel like things are going well (or going poorly) in your business, but updated books put the information in plain black and white for you to interpret. Sometimes intuition is important, but you should balance it with solid factual financial information. Many owners fail to create a budget for their small business. Those who do create a budget often don’t take the time to look at it again, after they create it. Each year, it is important to take the time to create an annual budget broken down by month. This allows you to make actual versus budget comparisons at the close of each month. A good budget blends actual historical financial information with your educated guess about the future of your business. It is important to keep your budget consistent throughout the year and compare your actual results to your budgeted hypothesis. Your budget doesn't change. If you create a budget, do you have to create a forecast? The answer is yes. Many business owners don’t know the difference between a budget and a forecast. A budget is an educated guess about the future that remains the same. A forecast is an educated guess about the future that is constantly changing. At the close of each month, I take a look at my budget versus my actual performance and analyze the difference. I look for big fluctuations, major problems, as well as any opportunities that I see. I then take that analysis and use it to forecast out the next several months. A good forecast takes into consideration any of the major changes that you know are coming. If you are about to release a new product or service, then you know the anticipated sales and costs associated with that. Additionally, you know the seasonal swings (if any) associated with your business and what expenses you are likely to incur. Business owners become obsessed with their past financial performance. However, they fail to look out into the future. Don’t worry so much about what happened in the past. What’s done is done. Take what happened and use it to forecast out into the future. Subpar business owners look at their past performance and do nothing but worry; they are preoccupied with the negative. Great business owners use their budget versus their actual to make an educated financial forecast. They then use all of the information they have to make critical business pivots to keep them on the path to achieving their goals. Anyone can look at past financial performance and point out the good and bad aspects. Few can take what happened and predict what will happen. Even fewer can take what happened, create a predication about what will happen, and make strategic moves to ensure that their business is a success. They are the ones I call smart business owners. 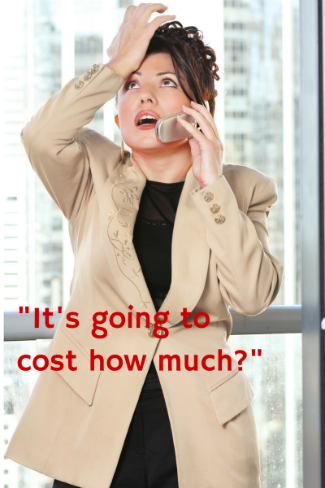 Have you made expensive mistakes in your business? Are you tired of it?